The QTU submission to the Education Minister’s Anti-Cyberbullying Taskforce canvassed the issue of cyberbullying of teachers and school leaders. And it’s about time more people were talking about it and more parents, students and community members reflected on their behaviour and the impact of things they say about teachers and school leaders in online spaces. As our submission says: “The QTU fields calls on an almost daily basis from distressed members who have experienced vicious cyberbullying from parents, students or community members. Many parents post aggressive comments in community groups when they are unhappy with an issue at the school. 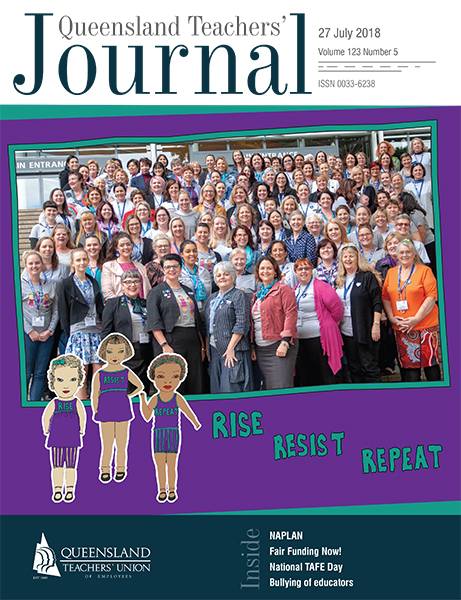 In recent times, the QTU has seen online petitions and campaigns targeting teachers and school leaders regarding everything from the school’s behaviour management policy to its student dress code and decisions regarding curriculum and pedagogy. There’s also the issue of conversations and gossip about teachers and school leaders, which used to occur at the school gate or in the car park but now take place on online forums and the Facebook pages of parents or students. Parents and students may claim that they have the right to raise issues in this way, particularly when they feel they have not got the outcome they wanted when raising the matter with the school, however this kind of behaviour is simply unacceptable. Programs asking people to respect teachers and school leaders are not enough. The perpetrators of such gossip and bullying are not doing it because no one said they shouldn’t. They are choosing to behave in a way designed to bully, intimidate and demoralise the person, people or school being targeted. Programs need to turn to the need to intervene in these situations and report them. The behaviour needs to be called out when it occurs. Parents and students can do this by not buying into such conversations online, or by bringing the conversation to the attention of the people or school involved. To simply ignore it is to be a bystander and allow the cyber-bullying to continue. I have experienced my fair share of online trolling, however most of it is perpetrated by people I do not know and will never meet, and it rarely makes me feel physically threatened or unable to do my work. The most debilitating thing about cyberbullying enacted by people within or connected to the school community is its proximity. The fact that most of it takes place in forums that teachers and school leaders cannot access to either intervene, report or defend themselves makes it even more insidious. Knowing it is occurring but having to wait until a responsible member of the school community draws it to the attention of those involved can impact on all parts of a person’s life. Implement an extensive, centrally funded, community education program to raise awareness of the issue of cyberbullying of school staff. Establish a centralised specialist cyberbullying support centre to which affected Department of Education staff can refer these matters for swift action. These actions should include: immediate steps to have the material removed, a range of support for the staff concerned and the engagement of legal action where appropriate. Amend the Education (General Provisions) Act (2006) to extend the provisions of trespass and abuse of employees to include online. Teachers and school leaders are best able to focus on the important work we do when we are supported by school communities and when parents or students who have concerns raise these respectfully through the avenues available to them via the school and regional office. It would be unacceptable for teachers and school leaders to be using online spaces to cyberbully parents and students, so why should QTU members have to put up with it?